Growing up, I was the only "Hanukkah kid" in my class, so my parents felt compelled to offer me a similar experience in what kids talked about most — the gifts! They would give us a gift each evening after we lit the candles. Often, this would amount to seven small toys and games, then a big gift on the eighth and final night. How lucky we were! But all those toys come and go — too often to the landfill, according to research from Vanderbilt University — so what could we do differently for the next generation? Giving to Others: I asked my son to think of some things we have a lot of that someone else might like. His response: stuffed animals. (Hallelujah!) He picked out the ones he wanted to give away; we'll wash them and bring them to a nonprofit to share with other children. As he gets older, we'll learn more about selfless acts of generosity — giving away something that's important to you, not just something you can spare. Game Night: We invited friends to come over to make latkes and play dreidel (spinning top) games. Somehow, a dance party was added this year! It's all about the kids having a good time and celebrating our freedoms. Book Night: An evening to celebrate the gift of reading and books. How fortunate we are to have so many books to choose from! My son received a special hardcover book, inscribed with a loving message and the year. Make Something Night: We cut out paper snowflakes to hang around the home and painted a picture frame to send to the grandparents. 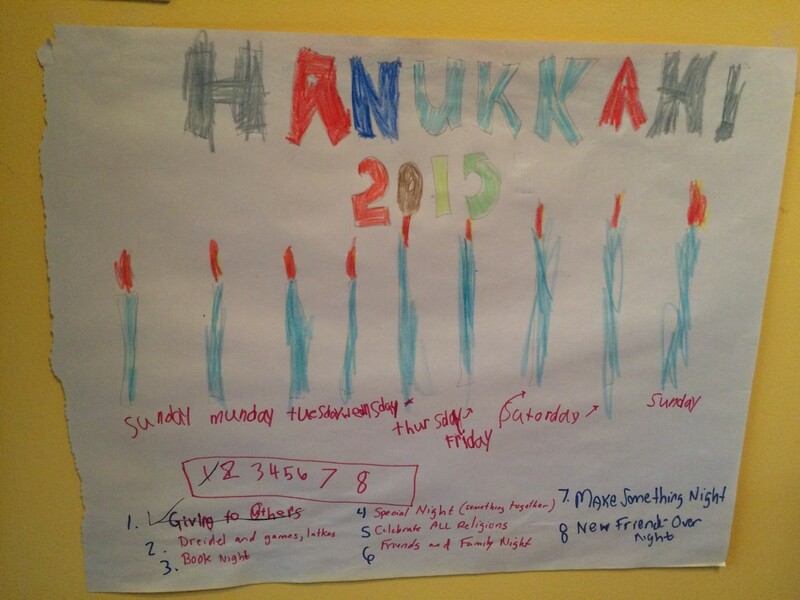 Celebrate All Religions: This is a new theme my son chose this year. I've been crowdsourcing for ideas, from making our own prayer flag and writing on each triangle many of the religions (including no religion) that exist in the world. At 7 years old, my son is learning that there are many ways people around the world look to something larger than themselves to feel grounded and to give them hope. As for Christmas? Last year, we went to Seattle's Fiddler on the Roof sing-along! In other years, I have signed up to relieve the volunteers who regularly support a mission-critical service, like Meals on Wheels, so they could enjoy this holiday with their families. These are a few ideas that can help us, through our actions, redefine the season and spirit of giving. There are many more out there, from organizations like Doing Good Together and Mother Nature Network. What are some of yours? Whether or not we are in a position to make philanthropic gifts with our wallets, we can all give big with our hearts.